AUGUSTA, Ga. — The biggest reason it’s fun to follow golf tournaments is to watch storylines unfold before us. Some, we write ourselves; others we can’t see coming until they’re upon us. That’s the beauty of sports — and sports are extra-beautiful on Masters Sunday. Entering the 2019 Masters, there were countless narratives bandied about. Some have already fallen by the wayside: Rory’s grand slam. Spieth’s grand comeback. World No. 1 Justin Rose validating top-dog status. But now, come Sunday early afternoon (or Sunday evening, or Monday sometime…) all others will peel away. That’s the magic. That’s the whole thing. We’ve had stories in our heads, and we’ve talked them out loud, and we’ve written them on websites. We’ve looked forward to this week since the same week last year. Now, there’s exactly one way this Masters will end. It’s just a matter of figuring out which way that is. How it happens: Bryson DeChambeau, currently two under, tees off No. 10 at 7:41 a.m. and gets red-hot. He shoots 13-under 59 and sinks the winning putt at 12:15 p.m. on the ninth green — with the flagstick still in! The Masters is never the same. I have been extremely impressed with the attitude and the moxie shown by Masters rookie Justin Harding this week, and he’s only five shots back of the lead. He is 100-1 at some sportsbooks to win the Masters. Every player ahead of him played in this year’s Ryder Cup. I very much do not think Justin Harding will win this golf tournament. Sure, this looks like a classic setup for Slick Rick to end up kneeling behind the 18th green at 2 p.m. as his buddy Tiger kicks in for glory — but maybe this is how it happens. Rickie Fowler starts the day six shots back and hammers at pins with reckless abandon, getting to eight under before he even knows what’s going on. In the half-hour after he finishes, the weather worsens significantly, Tony Finau’s club slips on the 18th tee and he makes triple, handing Fowler the win. The X-Man looked like he’d be contending for the 54-hole lead as he stood in the 15th fairway at 10-under par, iron in hand, ready to give the green a go in two. Now he’s five back, which means he’ll need some of the very same game fuel that propelled him to a final-round 62 at this year’s Tournament of Champions. The kid’s a cool customer and a legitimate top-tier talent; a Masters win would propel him into a different echelon of young studs. Where did today’s 64 come from? Who knows — but a Sunday sequel to today’s seven-birdie, one-eagle binge would cap off a career renaissance that has seen Simpson climb back into the world top 25. Simpson has performed surgery on Augusta this week, hitting 86 percent of fairways and 74 percent of greens. But I don’t see him completing the rally. Two words (and a powerful mental image): Visor spike. Somehow, some way, Dustin Johnson only has one major. That could change with one ridiculous day where he brings Augusta to its knees. But through three rounds, D.J. has made just three birdies on non par-5s. Something has to change. If Kuchar survived his internet ethering at the hands of playing partner Phil Mickelson this morning, who’s to say he can’t take down Francesco Molinari? What’s still lost in Tipgate and Sergiogate and wherever else Kuchar has gaffed is the fact that the guy is simply playing the best golf of his life. A major is the one thing missing from his resume — this couldn’t be the week, could it? Tony Finau has won exactly once on the PGA Tour, at the 2016 Puerto Rico Open. But he’s finished second four times — oh wait, that’s four times just last year. Now he sits in that position again. But he’s got a simple path to change that nice-guys-finish-second reputation? Slip on an XL green jacket. Brooks Koepka walks off the green after his Masters round on Saturday. Koepka is three off the lead with 18 holes to play. 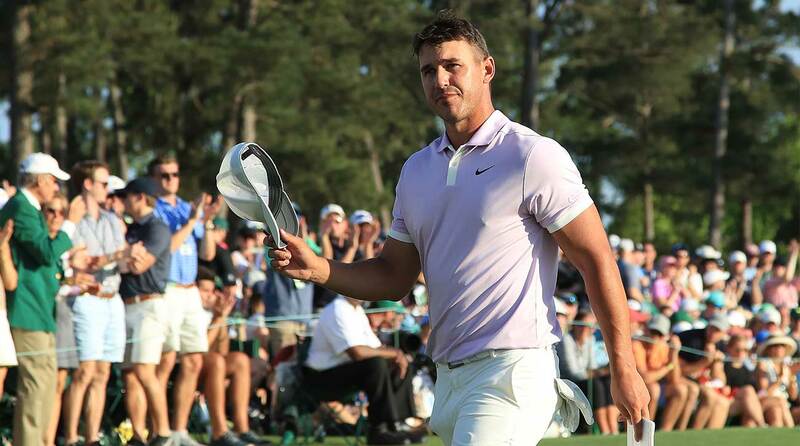 On the eve of Game of Thrones’ return, what better result from golf’s biggest event than King Koepka staking a claim to the highest office in the land? After Thursday’s opening 66, everyone was convinced Koepka would run away with this thing. He’s done this weird thing the last two days where he’s played his way out of the lead but then suddenly back to the edge of it — his Saturday eagle on 15 serving as prime example. A win for Koepka would mean four majors in seven tries. Four majors before age 30. It would mean only Tiger Woods and Phil Mickelson would have more majors among active players. This is heady, heady stuff — and it’s got a solid shot at coming to fruition. Are you ready to appreciate his run for what it is? What a contrast we find ourselves with in these final three fellas. Koepka and Molinari are engines of inevitability, relentlessly pounding away, shot after shot. Nothing they do feels miraculous; when they’re rolling, their mistakes are shocks. These two have been the two biggest gamers of the last two years, and having them atop this leaderboard feels like golf gravity. Where, then, does Tiger Woods belong in this conversation? How is it that we’ve made it back here, to a 43-year-old Woods doing battle in the final group on Masters Sunday? A Woods win is so close, just 18 holes away. Sure, Woods couldn’t take down Frankie last fall in France, but this is different. This is stroke play. There are no teammates here. And it’s on Tiger’s turf. Finau and Molinari will both fold in his presence as Tiger continues to paint pictures with his irons and runs away with this by three shots. Feel impossible? It’s not. Not anymore. You want someone who can make a claim to the throne? Yeah, you’ve seen the pictures by now: Francesco Molinari caddied in Tiger Woods’ group at the Masters last decade. But in the last year, he’s stomped all over him. Frankie won Woods’s own tournament, the Quicken Loans National, last July. Two weeks later, he watched as Woods, his playing partner took the lead at the British Open on Sunday. Then he chased him down and buried him en route to his first major championship. At the Ryder Cup, Molinari took down Tiger three times in two days, went undefeated in his five matches and became an international golf icon. And you’re telling me Francesco Molinari is somehow going to lose a two-shot lead to this guy? Whether it has been spelled out above or defies prediction, we know that there will be an end result. There will be one winner, and we don’t know quite how he’ll be crowned. But that’s the thing about sports, and about golf, and about storylines: the ones that actually happen are generally far better than whatever you’d predicted in the first place.